We want to say “Thank you!” for being an Azura VIP client by hosting lots of fun events in 2018! 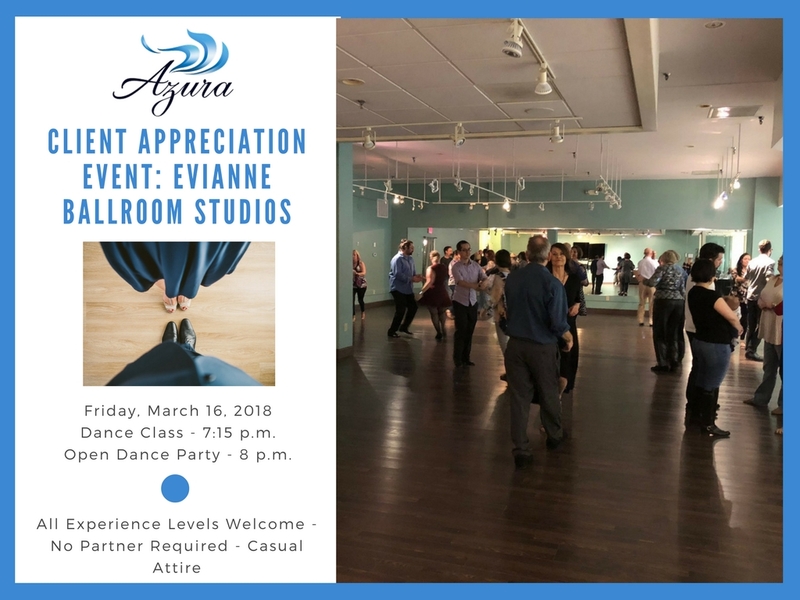 Earlier this year we hosted a free yoga day at Barre-Up and we are so excited about our upcoming client event, a free dance lesson at Evianne Ballroom Studios on Friday, March 16, 2018. Learn the basics of two or three different styles of dance starting at 7:15 p.m. and stick around after for an open dance party. Try out those new moves on a social dance floor and socialize with our lively dance crew! This class is usually $5 but we are picking up the tab for all of our wonderful clients. Casual attire, unless you are feeling fancy, and there is no partner required. We can’t wait to dance the night away with you at Evianne Ballroom Studios located at 1105 Walnut Street in Cary. Evianne Ballroom Studios offers over thirteen styles of ballroom dancing including Waltz, Foxtrot, Tango, Rumba, Cha-Cha, Swing, Salsa, Merengue and many more. Learning to dance improves your confidence, tones your muscles, and is an enjoyable alternative work out or date night! They offer private lessons, group classes, fitness classes, and a party night!